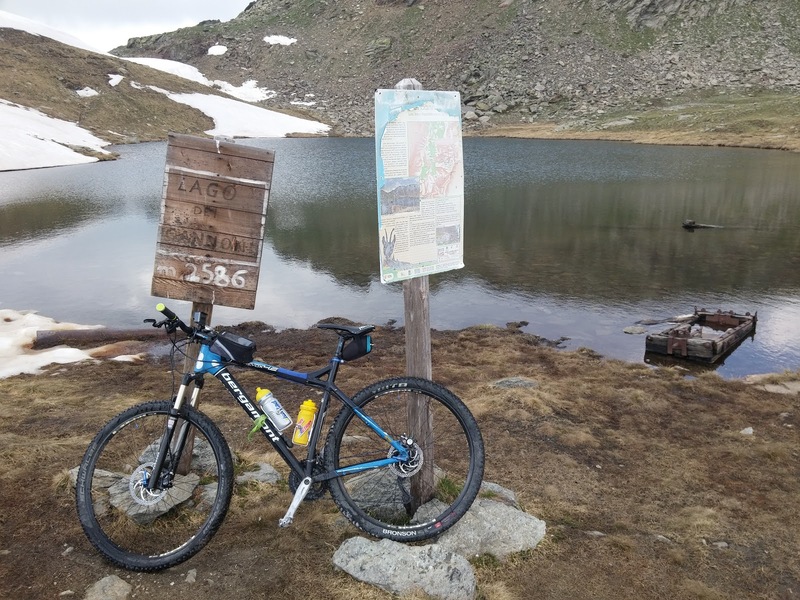 Just a few kilometers from Turin, in the pleasant Val Germanasca you can find an hamlet, Trossieri, the starting point for this pleasant, but not banal, MTB tour to be done only with optimal weather conditions otherwise you may be having to go back on your way badly. From Turin we left for Perosa Argentina from where we take the SP 169 to Prali. Shortly after the Trossieri hamlet there is the deviation for Conca Cialancia. You can park the car on the slope that meets 200 meters after the bridge over the Germanasca torrent (Km 0), It is a route from the considerable altitude that takes advantage of an old military road never completed. According to the project elaborated in 1938 by the Genoese Military in Turin, it must have reached, passing the Passp Cialancia, the area of the 13 lakes where a battery of outdoor cannons was planned. The road for the first part goes to the valley of the rio de Balma in a thick wood with medium slopes but ideal for good warming up. Leave the well-known side deviations for Pian Faetto (0.71), Serre Giors (1.63), Clot (2.62), Maisetta (3.39) and Cro / Linsard (4.19) End of asphalted part (4.5 km). The road continues now with long halfway slope road, among vast moltitude of rhododendrons. At the junction for the Alpe Cialancia / Alpe del Lauson (13.93), near which the lake is located, continue with the left with the roadds that tends to get worse. Pay attention to the taps that often block some of the roadway even during the summer season. 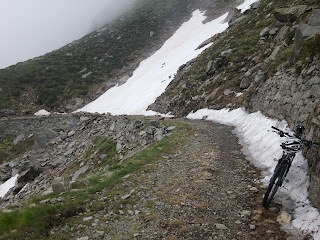 Two curvy bends and an equally tiring straight strech lead us to the collar on the ridge that goes down from Punta Lausarot (16.47), beyond we continue with a more affordable slight slope. In this photo you can see the road that leads to the Conca Cialancia with clear Passo Cialancia that we must reach to the upper right. 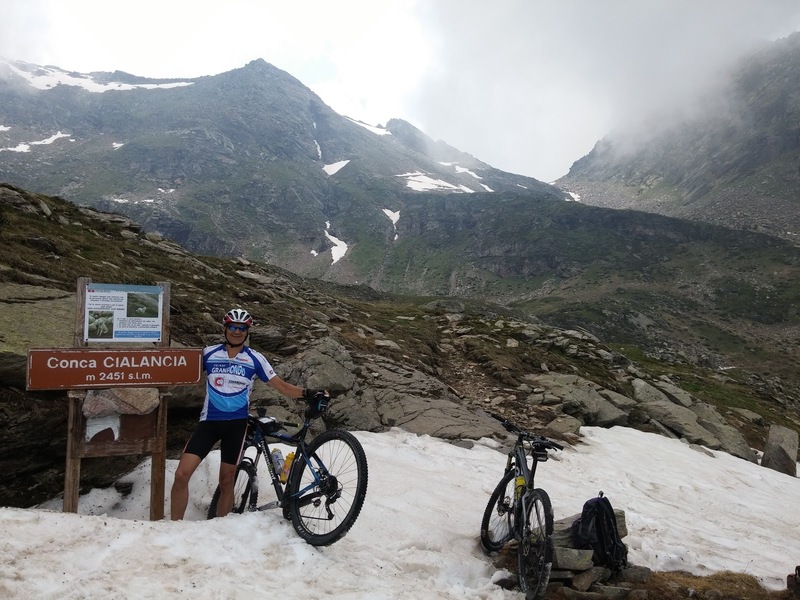 One last effort to face two close bends and then to the twenty-two km uphill the road stops abruptly with an ideal slargo to stop for a moment to regain breath for the last and difficult task but we are in Conca Cialancia! 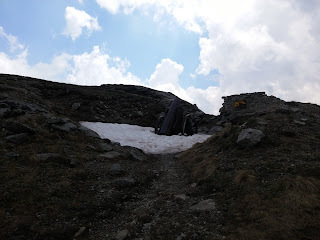 The Conca Cialancia is still snow-covered despite being on June 24th, on the right it is the visible the PAsso and the grassy ridge to be faced to reach it. Above us it is well known the Passo Cialancia altitude 2683 (30-40 from Conca Cialancia). It is advisable to continue on the path that stands out in front to be able to admire two little ponds nearby: the first one is on the right while the other one is reachable by crossing the hillside that is on the opposite side. Breathing again, we passed the creek that feeds the first pond and bravely meets the ramps embellished by the rhododendrons. With the faithful MTB on the shoulders or side up to the clear path that starts from the last hairpin we avoided to reach the Beautiful basin and we didn't not want to reach again in order not to lose any quota. Once you reach the trail you follow it faithfully with the goal of reaching the hill always bicycle on the shoulder, but the fatigue is repaid by the wonderful view that opens when you reach the Passo Cialancia. 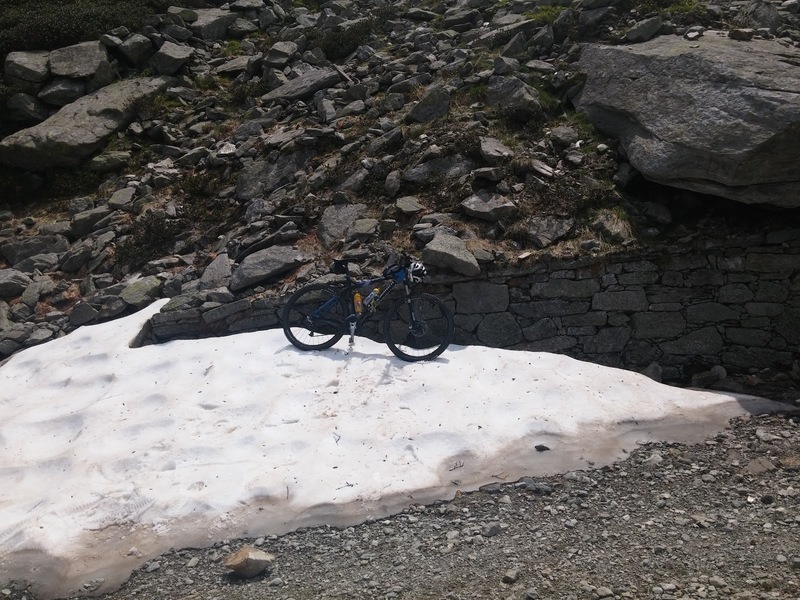 From the Passo Cialancia the initial descent is immediately technical, but never exposed, and for those who like it can be very fun!! 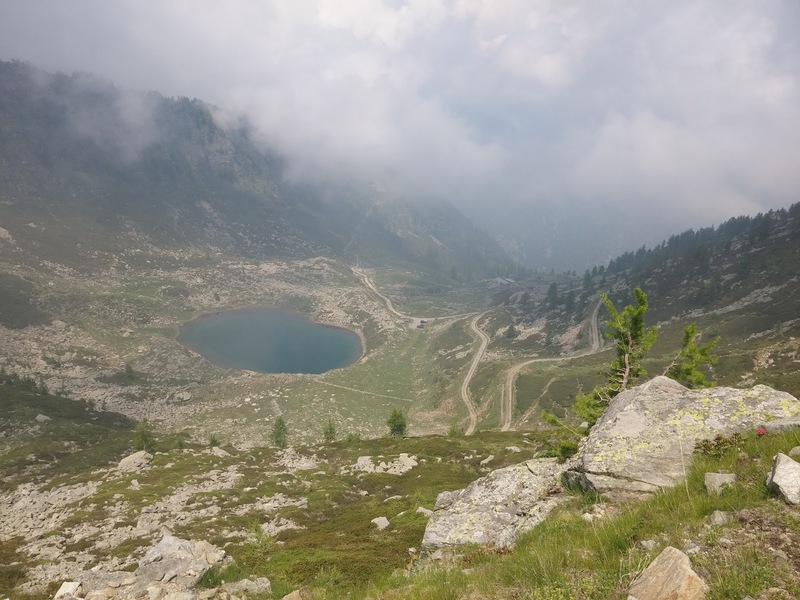 After completing the first part of the descent you will come to meet the Ramella lake with the characteristic mortar still arranged on the shores. The descent continues in the middle of the meadows to the "Perrucchetti Caserme" (Perrucchetti barracks), from here you can choose to trace the ridge that surrounds the CAppello d'Envie (non-cycling trails) until the arrival of the ski installations from the underlying Prali and then exploit The fun bike park or go straight to the village through a gorgeous trail that starts right out of the abandoned barracks (GPS track records this choice). The first part of the descent is a bit steep, and then the slope decreases at length and is more and more pleasant until it meets a newly constructed interpoderal road that leads us down to the valley between meadows and forests. 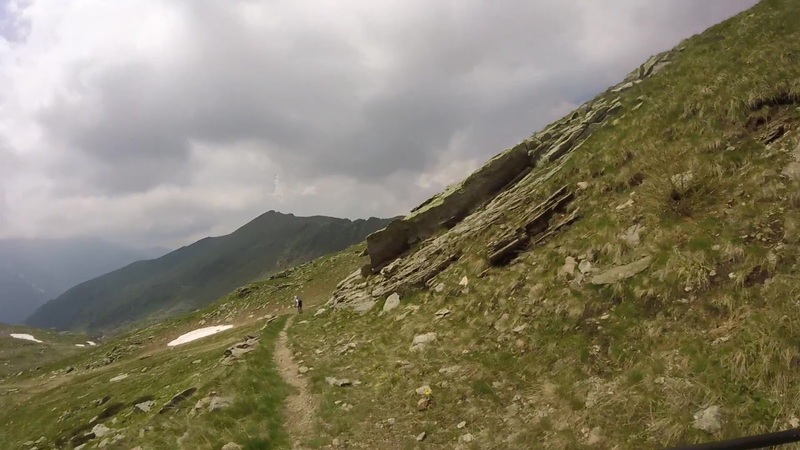 When you come to Prali you only have to be armed with holy patience and enter the Provincial of the Val Germanasca to drive in a fast descent the nearly 15 km that separate us from the starting point.